Chief Tissahamy and son Wanniya never considered violence as an alternative. The old Wanniyalaeto chieftain Uru Warige Tissagami (popularly known as Tissashamy) and his kinsfolk of Kotabakinni, however, refused to be evicted from the land of their ancestors. Officials considered him to be very obstinate and stubborn, for he would not budge an inch no matter how many emissaries came to "talk sense" to him. Finally the government had to concede that these seven families could remain as long as the old man lives. 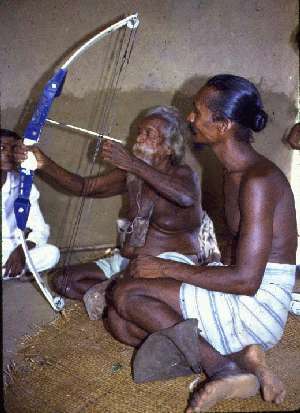 However, according to the 1987 Master Plan for Maduru Oya National Park, the day that aged chief Tissahamy expires, the rest his kinsfolk will have to evacuate the hamlet immediately.7 Knowing this, Tissahamy even refused to die (note: Tissahamy finally expired on 29 May 1998 at the reputed age of 104). However disadvantaged the island's indigenous forest-dwellers may appear to be in the eyes of modern-educated observers, nevertheless their sense of honour, justice, and fair play is very keen. Despite centuries of injustice and exploitation by economic predators from outside communities, even to this day the Wanniyalaeto people remain so gentle and patient towards younger cultures that, although they are proficient hunters, they have never been known to raise a weapon in anger, to commit theft or fraud out of greed, or even to raise their voice toward outsiders, let alone to speak any untruth for personal gain. Indeed, these are precisely the elements of their cultural heritage that the Wanniyalaeto are most anxious to preserve for future generations. Colonised Wanniyalaeto are deeply dismayed by the corruption of their culture caused by forced assimilation into a modern society which they regard, justifiably, with utter contempt.